The 2017 NFL Draft is just 22 days away, as the first round will get underway from Philadelphia on April 27th. Already looking ahead to 2018 though, where the Cowboys will hopefully hold the 32nd overall pick following another dominant draft this year, Dallas has emerged as the favorite to host the 2018 NFL Draft at their new breathtaking headquarters - The Star. Dallas has emerged as a favorite to host the 2018 NFL draft at the Cowboys' new headquarters in Frisco, Texas, per @FieldYates. The Cowboys vision for The Star at Frisco was for their new facility to provide the absolute best experiences for players, coaches, executives, fans, and even local high school football teams that competed at the Ford Center. Hosting the 2018 NFL Draft would be an incredible experience for everyone involved, as there is already a draft party planned for this year's event at The Star. 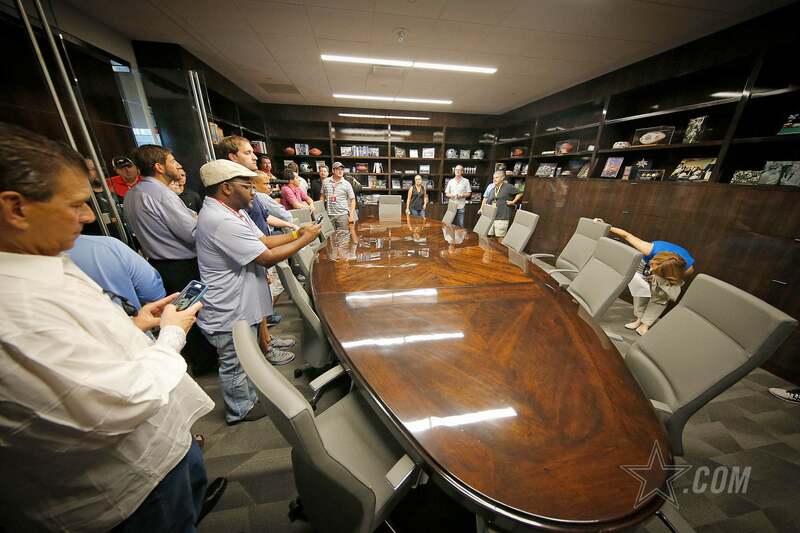 Draft night this month will provide Cowboys Nation with our first look into The Star's new war room in action, with Jerry Jones, Will McClay, and Jason Garrett orchestrating a draft that will look to bring next year's NFL Draft to the beautiful home of the defending Super Bowl champions. Inside The Star will keep you updated on the location of the 2018 NFL Draft, and if it indeed ends up inside The Star. Tell us what you think about "Dallas Cowboys Emerge as Favorites to Host 2018 NFL Draft at The Star" in the comments below. You can also email me at Sean.Martin@InsideTheStar.com, or Tweet to me at @SeanMartinNFL! Film Room: Why Have Cowboys Defensive Backs Failed To Create Turnovers? The Dallas Cowboys already have a lot of young talent at the cornerback position. But with two key players close to free agency, it's an area where they could still consider adding a player in next week's 2019 NFL Draft. Dallas has assembled a solid group at corner with the use of several higher draft picks in recent years. They spent a first on Byron Jones in 2015 and then their second and third picks in 2017 on Chidobe Awuzie and Jourdan Lewis. Also in the mix is Anthony Brown, a sixth-round pick in 2016 who has proven to be a true steal. At this point, one could argue that he is tied with Awuzie's as the team's second-best CB behind Jones. Unfortunately, those affordable rookie contracts don't last forever. Byron's has already expired; he's currently set to play 2019 under the fifth-year option. Brown's rookie deal expires this season, meaning both players could be unrestricted free agents in 2020. 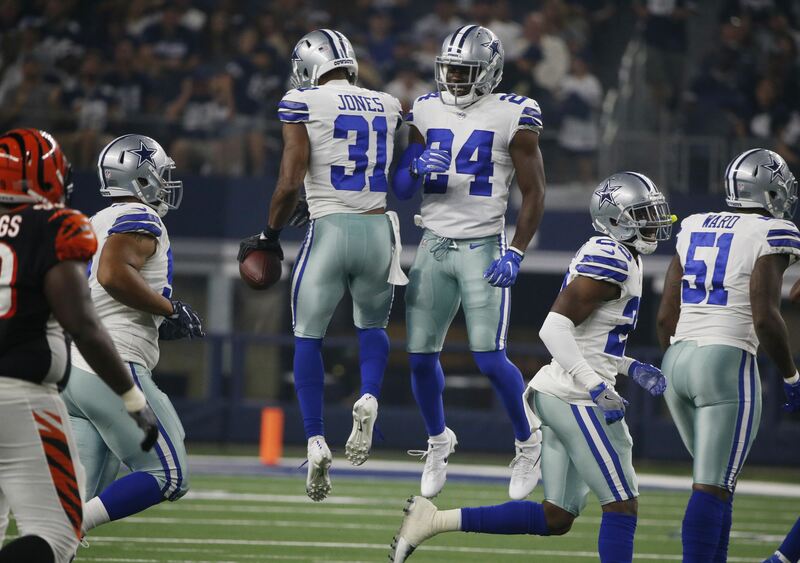 The Cowboys have already expressed interest in re-signing Byron Jones to an extension, and they should after his Pro Bowl season last year. But a big contract for Byron means less money for the other guys, who will all be looking for new deals over the next two offseasons. That said, these are situations that the Cowboys can resolve in other ways between now and 2021. There's no real pressure to add more CB talent now given the timetable. A far more significant factor is the way that Jourdan Lewis appears to currently fit into Dallas' scheme. After an impressive rookie season, Lewis surprisingly slid down the depth chart last year. He was the team's fourth CB, only appearing on 18% of Dallas' total defensive snaps. The other three players we've mentioned were all at 67% or higher. One key reason for this may have been the arrival of Kris Richard as Defensive Backs Coach. He brought a new philosophy about the size and playing style of cornerbacks which Lewis doesn't seem to fit. Even if Jourdan isn't valued much in Dallas anymore, he could still have worth elsewhere in the league. After all, Lewis was considered a potential first-round talent in 2017 but slid to the third after some concerns over legal issues. With two years left on a cheap rookie deal, Lewis could be very attractive to other teams in a potential trade. If the Cowboys did move him, that would open the door for them to spend a pick this year on a new CB prospect. That doesn't mean Dallas would spend a high pick at corner. After all, they still have their top three in place for this season. Plus, as we've seen recently with Brown and Xavier Woods, the Cowboys have been able to find solid defensive backs in the later rounds of the draft. That gives us an "If... Then..." situation when it comes to cornerback and this 2019 draft. If the Cowboys stick with Jourdan Lewis then I could see them not draft any corners, or at least waiting until the late rounds for some intriguing developmental prospect. But if they do trade Lewis away, Dallas could spent as high as a fourth or fifth-round pick to help fill the depth chart and hopefully prepare for the upcoming free agency of their current players. Running back is a need for the Dallas Cowboys heading into the 2019 NFL Draft. Despite counting with Ezekiel Elliott, the team urgently needs someone for Zeke to share the workload with. If the Cowboys want to Elliott to last longer than your average star running back, they'll have to add a young backup to that RB room. So far, it looks like the front office will address the position via the NFL Draft, having let Rod Smith become a free agent and passing on some interesting options in March. This year, the running back class is a pretty interesting one. Over the last few years, college football has brought many unbelievable players at this position. In 2015, it was Todd Gurley. Then would follow guys like Ezekiel Elliott, Leonard Fournette, Christian McCaffrey, and Saquon Barkley. This running back class though, doesn't seem to have a player of this level. However, it does count with tons of guys who will make for valuable picks in the middle and late rounds. The rookie class is led by the Alabama product, Josh Jacobs. Although the consensus agrees he's the top running back prospect, many see him falling off the first round. Even if he's picked on Day 1, it isn't likely he'll be drafted in the Top 20. Teams like the Philadelphia Eagles at #25 or the Oakland Raiders at one of their three picks are candidates. After Jacobs, there's a wide array of prospects who might not even go in the second round but when the third round begins, they could start flying off the shelves. While this draft class does not necessarily count with top players at this position, it does provide a lot of depth. The good thing is the Cowboys don't need a starter, they need a backup. From Penn State's Miles Sanders to Oklahoma's Rodney Anderson, there will be some pretty interesting guys who can bring a change of pace to an Ezekiel Elliott-led offense. There are many prospects worth talking about, but one I personally like is Texas A&M Trayveon Williams. Matt Miller from Bleacher Report goes as far as saying that he ranks as the best third down running back thanks to his pass protection and his skills as a receiver. While some see him as a third rounder, I wouldn't doubt he lasts until day 3. If he does, the Cowboys shouldn't hesitate to draft him. Which brings me to another point, if Dallas really wants to walk away with a rookie contributor, they should address this need between the fourth and fifth round. They don't own a sixth round pick and waiting until the seventh round wouldn't really lead to an upgrade over guys like Darius Jackson. However, both the second and third round would be too early for a team that has way more relevant needs. With two selections in the fourth round (#128 and 137), this would probably be the best spot to find Zeke a promising backup. The fact that this is a pretty deep class for the running back position will benefit the Cowboys and I don't doubt they'll get a pretty decent player to help their superstar running back get a bit of rest every now and then. Tell me what you think about "NFL Draft: 2019 RB Class Could Benefit Cowboys" in the comments below, or tweet me @MauNFL and let’s talk football! If you like football and are looking for a Dallas Cowboys show in Spanish, don’t miss my weekly Facebook Live! show, Primero Cowboys! This is the week that we've all been waiting for. The NFL Draft is now just five days away. The Dallas Cowboys will finally be able to put all the hard work they've done over the last year into practice. They'll finalize their big board and will add six (or more) players to their roster between now and next weekend. As it's the last week before the draft, I wanted to bring you one final mock draft. This one will focus on the Dallas Cowboys pre-draft visitor list. They've had contact with tons of players over the last several months, so we should have a pretty good idea where their collective minds are at. Of course, the draft brings so many variables into play that it's hard to accurately predict who will go there, but we're going to try anyway. Using Fanspeak.com's Premium On The Clock Simulator, I declined options to trade back in the second, because they required trading back a full round. In trade back scenarios, I wouldn't want to trade back further than the fifth pick in the third round. The Cowboys would miss out on too much talent by going back a full round in the draft. I attempted to focus this mock on players that the Cowboys have had in for visits this offseason. So let's find the Dallas Cowboys some players. Juan Thornhill has been a guy I've hyped up for much of the last two weeks. Until I watched his tape, I was all about Maryland Safety Darnell Savage. In Thornhill, I saw a similar player to Savage, but a better overall athlete that is bigger as well. Thornhill is in that group of safeties along with Taylor Rapp, Jonathan Abram, and Savage, who could be there for the Dallas Cowboys at pick 58. While each in that group are capable of making a day one impact for the Cowboys, Thornhill is the guy that I think has the best potential. He's smooth in coverage and willing as a tackler. He plays the ball well in the air and is excellent with the ball in his hands. He has the ability to play corner if needed. At Virginia, he lined up all over the secondary. 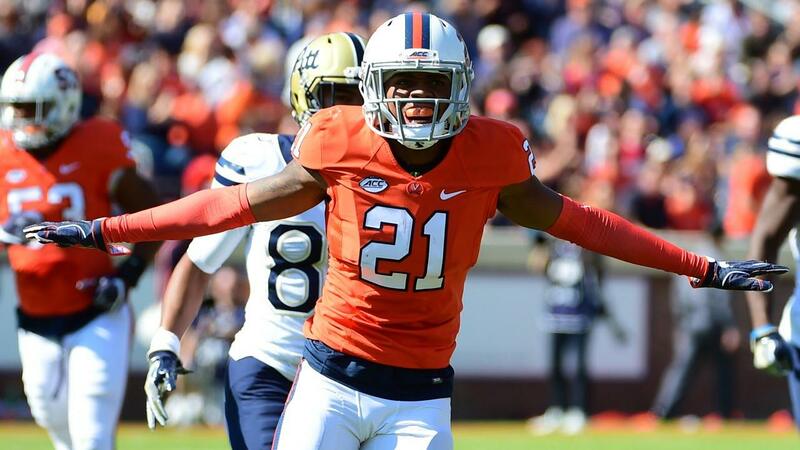 "A three-year starter at Virginia, Thornhill arrived in Charlottesville as a safety before moving outside to corner his sophomore and junior seasons. He moved to the “Sabre” strong safety position as a senior and led the team in tackles (98) and interceptions (6), playing everywhere from nickel to single-high to linebacker (showed he can just as easily press as he can play from deep positioning). Thornhill, who wears No. 21 for Sean Taylor, doesn’t play as fast as he timed, but he has a smooth lower body and doesn’t get off-balance in his movements. He has plus anticipation and ball skills, but will take the worst of hits when his tackling technique isn’t perfect. Overall, Thornhill is more smooth than sudden, which causes him to be a beat late at times, but his instincts, field range and roster versatility are strong selling points, projecting as a high alignment safety who can walk down and cover slot receivers." He's Dane Brugler's 49th ranked player and fifth best safety in this year's draft. Over the course of Thornhill's career he totaled 13 interceptions and 26 pass deflections. He's a playmaker that stays around the ball and would give the Cowboys another ball hawk in the secondary. Check out Brian Martin's Scouting Report on Virginia Safety Juan Thornhill. I don't think that tight end is as big of a need in this year's draft because I firmly believe that Blake Jarwin and Dalton Schultz are solutions there long-term. However, sometimes the draft doesn't fall like you'd like and here, there weren't any defensive players available that I was as interested in as Texas A&M Tight End Jace Sternberger. Already off the board were any of the EDGE players that the Cowboys have shown interest in as well as Defensive Lineman Trysten Hill and Khalen Saunders. There were several wide receivers available that the Cowboys have had in for visits, but I felt like there was an opportunity to get one of those later in the draft, thus the pick of Sternberger. "A one-year starter at Texas A&M, Sternberger quickly emerged as the centerpiece of the Aggies’ passing game, lining up split out, wing or inline. Despite only one season in College Station, he is one of the most productive tight ends in school history, setting the single-season records for receiving yards and touchdown catches. With his athleticism and toughness, Sternberger offers tremendous YAC and down-the-seam value, recording at least one 20-plus yard catch in 12 of 13 games in 2018 (44 percent of his catches resulted in a 20-plus yard play). He is a work-in-progress as both a route runner and blocker and his NFL ceiling will be closely tied to his development in both areas. Overall, Sternberger is a vertical pass-catching target with the athleticism and warrior toughness to be a mismatch weapon, projecting as an NFL joker tight end." He's a field stretching tight end, similar to Blake Jarwin, with a better pedigree and more college production. Potentially, Sternberger could get snaps right away as a move tight end as he learns his blocking responsibilities. There are several wide receivers that bring a speed dimension to the NFL draft this year and Emanuel Hall is one of them. He had good production at Missouri, but injuries kept him from having the type of career that potential first round pick Marquise Brown had. Like Sternberger, Hall could make an impact week one in three and four wide receiver sets on the outside. With Amari Cooper's ability to line up in the slot, Hall on the outside would add another dynamic element to this young and improving offense. "Prototypical size and length... excellent release package at the LOS... sets up corners well with head fakes and quick, deceptive feet... Long strider... few corners can keep pace with him vertically... good tracker of the ball... sneaky good route runner... keeps corners on their toes because of his deep speed... takes advantage with an array of double moves... great body control and adjuster to the ball in the air." See my Scouting Report on Missouri Wide Receiver Emanuel Hall. Alabama Running Back Damien Harris was a productive player in college who averaged 6.4 yards per carry for his career. Over the last three seasons in the Crimson Tide backfield, Harris totaled 1,000 yards each season. In 2018, he caught 22 passes for 204 yards for 9.3 yards per reception. Over his final two years, he totaled 20 touchdowns on the ground. Only five times in his 54 games played in college did Harris receive more than 15 carries a game, so he's not coming into the NFL as a workhorse type back, but he has potential to work in a running back by committee. For the Dallas Cowboys, if he can take 5-10 touches a game from Ezekiel Elliott, it will help keep Elliott fresh down the stretch and hopefully keep Elliott from seeing 400 touches. "A Swiss army knife type of running back who possesses good traits in nearly every facet of the game. Solid experience and production as a ball carrier, receiver, and pass protector for an elite program. Nice contact balance and rarely goes down on arm tackles. Underrated footwork and vision. Scheme-versatile to play in both zone and power schemes." Check out Brian Martin's Scouting Report on Damien Harris. The Dallas Cowboys don't really have a huge need along the defensive line in 2019, but when you look ahead to the 2020 offseason, you could be without Antwaun Woods, Maliek Collins, and Tyrone Crawford. The Cowboys would have big needs along the defensive line if they were to move on from Crawford to save money on the cap, they would need a 3-technique defensive tackle. Kingsley Keke could be a potential starter. In 2018, at Texas A&M, Keke had 7.5 sacks and 51 total tackles and 11 tackles for loss. At 6-4 and 305 pounds, he's a player that could give you some snaps at 1-technique on passing downs and be your primary 3-tech in your base defense. He's a productive player with good athletic traits, so getting him in the fifth round would be huge for this defense. "A quick interior defender with position flex as both a base end and nickel rusher in multiple fronts... played his best football at the end of his career... seven sacks and 11 tackles for loss... 35 consecutive starts... proven durability... a lightning- quick first step with an impressive array of pass rush moves... moves really well and is light on his feet... plays with impressive bend and cornering ability." "A three-year starter at Texas A&M, Keke started at nose guard as a sophomore and junior before losing 20 pounds prior to his senior season and moving outside to defensive end under new defensive coordinator Mike Elko. 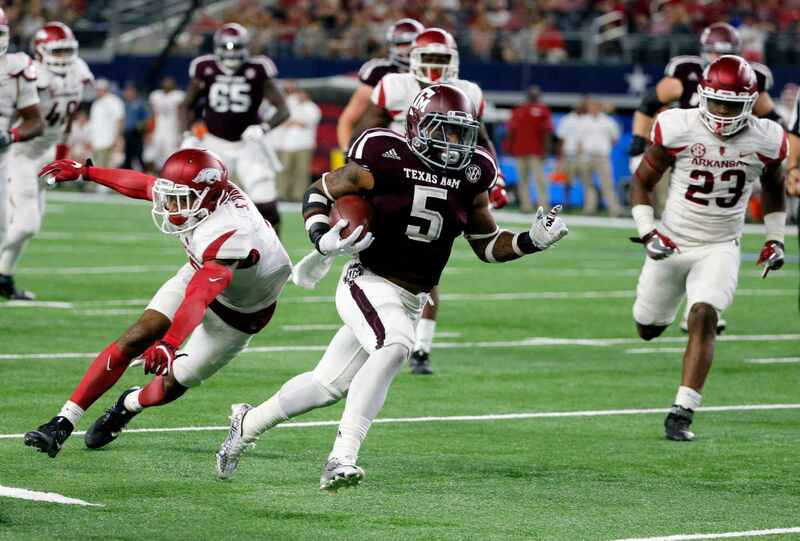 He was listed as an end on the depth chart, but he also played substantial snaps over the A-gap and B-gap in 2018 as the Aggies took advantage of his versatility. Keke is an active athlete and moves well on his feet to slip blocks and chase in pursuit. He flashes upper body strength, but plays too high and is too easily slowed by road blocks, lacking pass rush tempo or core strength to consistently work through contact. Overall, Keke’s inconsistent contact balance and marginal anchor strength will limit his NFL ceiling, but his foot quickness, nonstop effort and position flex are appealing traits, projecting as a base end in a 4-3 or rotational interior player." Kentucky Cornerback Chris Westry is a project player, but has a lot of experience, size, and athleticism that makes him an interesting player to take in the seventh round. That's what you're looking for in the seventh round of the draft. Guy who have traits that with some coaching and an NFL training and conditioning program could turn into productive role players for your team. "A three-year starter at Kentucky, Westry was a full-time starter as a freshman and sophomore at Kentucky, but gradually dropped down the depth chart as Derrick Baity improved and Lonnie Johnson arrived from the JUCO level. He was the third cornerback on the depth chart as a senior, playing primarily in the boundary when he was on the field. Westry has exceptional straight-line speed to stay stride for stride with receivers or quickly make up ground when he gets a late start. However, he plays undisciplined with a questionable mental process, struggling to recognize routes or create production. Overall, Westry is a better athlete than football player right now with questionable football intelligence, but his size/speed numbers are rare, which will get him drafted as a high upside project." The Dallas Cowboys may not have a ton of holes in the 2019 roster even before heading into the NFL Draft, but this draft sets up nicely for them to upgrade several positions for 2019 and beyond. If the Dallas Cowboys can pull off half of this draft, I think it should be considered a really nice weekend for the Cowboys. They add potential starters at safety, tight end, wide receiver, and 3-tech, as well as a good backup at running back, and project corner. What do you think of this Dallas Cowboys mock draft?